NEWS: The Thompsons received notification yesterday that they will be evicted on October 15. They ran a popular, profitable business, broke no laws, and received no infringement notices related to their stock numbers. UPDATE #2: See below for the most useful thing you can do if you want to help them. Here is a key point people have asked about in comments. What about the community? How do the people of Narrogin feel — do they want the farm to stay? Narrogin is a town of around 5,000 people. 900 people signed a petition in support and the two nearest neighbors want the feedlot to stay. They don’t just agree the feedlot should run at 10,000 head, they put their names to 15,000. People give Matt money in the street, the complainants live further away than some strong supporters, and the piggery was operating right next door for all those years. The Shire has written to the DEC urging them to allow the business to operate. We the undersigned residents of the Narrogin District hereby support Matt and Janet Thompson in their bid to complete their cattle feedlot development to a capacity of 14,490 head. We appreciate the benefits that this business brings to our community, and we believe the Thompsons will continue to make improvements which will minimize nuisance issues. Matt tells us people in the street hand him $50 notes and tell him to keep fighting. The local government authority which is the Shire (like a county) has supported us and appealed our license on our behalf on numerous occasions. Individuals have appealed on our behalf and signed petitions in large numbers. DEC does not consider positive comments or submissions. People in town have offered us their homes, their cars, and brought us food. Walking through the streets of town people have handed me fifty dollar notes and told me to keep fighting. We do have our opponents locally but they are a very small group, and we have many many friends who have bent over backwards to help us in our time of distress. their project up to 15,000 head as originally approved. My property is immediately west of the feedlot and I have lived here for 4 years. consider normal for a rural area. product that has helped me manage my small farm in a responsible and more efficient manner. people and they are active participants in the Narrogin area. The economic impact of this business is substantial with local farmers being able to sell their products. I don’t think that this economic benefit has compromised the environment in any real way, and I hope the Thompsons are able to stay in business as I know that they have been significantly affected by not being able to operate at full capacity. For the past four years we have been recycling manure from the feedlot on our crops and pasture with very good results. This fits in well with our farming policy of not using chemicals whever possible. I realise there have been problems of odours from the feedlot in the past, however we have not been unduly affected and especially for the last 12-18 months have rarely noticed any odour. We think of Matt and Janet as good neighbours, and have always found them civil and helpful people to deal with. Our hope is that the feedlot will operate in the future as a sound and profitable business. W.E. Furness and P.M. Furness. Shire president Richard Chadwick wrote to the DEC urging it to sort out the license issues as quickly as possible. …the DEC did not have sufficient justification for the forced destocking to 6,000 head. The license must allow for the keeping of up to 10,000 head. Any delay will surely see the demise of this business which will be a tremendous loss to our community. There is a very real fear that this business may not survive this current situation and will be lost to our community. The Local Community Consultation Committee (LCCC) approves. It was chaired by none other than Barry Carbon, who I believe wrote the 1986 EPA legislation. … the Chair of the LCCC recommended approval be given for the feedlot to operate at 10,000 head. The evidence shows most days there is no odour detectable in the town. The complaints don’t correlate with stock numbers on the feedlot, and over 6,000 recordings were taken in the town. See my post on the empirical evidence. Could it be about money and not the environment? The local real estate agent points out that land values in the area are rising just like everywhere else and there is no evidence the feedlot has affected land prices. Here’s one vocal complainant asking for rezoning – see page 13. Point 59. The Gows bought the property in 1995, close to the piggery that has been next to the Thompson’s and has been operating for 28 years. An application has been received from Mr & Mrs Peter & Karren Gow requesting Council to support the rezoning of Lot 2 Katta Road, Narrogin from ‘Farming’ to ‘Special Rural’ in the proposed new Town Planning Scheme. The comments are open here (and on all the threads) and dissent seems to be limited to a small group of vocal complainants. I’ve put together a one page central spot for links to all posts and info. Where are the young idealist lawyers who want to carve a name for themselves? Where are the legal action blogs? There is a small glimmer of positive news. A few politicians have come on board to advocate for the Thompson’s cause and to try to mediate with the NAB (National Australia Bank). This coming Wednesday (September 28), a meeting has been arranged between this group of Politicians & Cameron Clyne the CEO of NAB. Matt & Janet appeal to you not to get into a bank bashing frame of mind. This whole sorry saga has been caused by environmental extremists and more specifically the DEC.
Matt believes that he owes the NAB the balance of the loan. Narrogin Beef Producers can repay this loan if they are allowed to operate the facilities at full capacity and without ridiculous arbitrary compliance clauses imposed upon them that no one else has to meet. Matt & Janet appeal to the NAB to support them against the DEC so they can be productive members of the community & pay back their creditors. Just a thought, if you’d like to help the Thompsons by contacting Mr. Cameron (CEO of National Australia Bank) — consider a single petition signed by as many as possible in the Town and Narrogin Shire. There are only about 4,500 people minus children so this shouldn’t be difficult. The petition should be formal, business like, and NOT inflammatory or it wouldn’t be taken seriously. DEC doesn’t consider the support of the community to be of merit but Mr. Cameron (CEO of National Australia Bank) does and will take the petition very seriously. Jo, your sense about the “real” problem here is correct. This is all about authority gone bad. Stay on it! My heart is with you Matt and Janet!!!! A mighty fantastic effort,a question to all readers, why is it so impossible to get media and ministers to respond on property right issues, is there something so WRONG it cant be buried deep enough.Todays paper Barnett is deeply concerned with asylam suicide, what of Australians committing suicides, family breakdowns all manners of trauma, due to policies that restrict people from achieving benefits for their labour. Peter Spencer was spot on, nothing less than a National enquiry should be sought for the loss and restrictions that has befallen on property owners all over Australia. What you have documented here is a remarkable effort and is the one stop shop for would be journalists that don’t have the time to research. Since you have given them a good story- the least that they could do is use it. The woman at the switchboard@ head office says that the only way to communicate with the ivory tower there is through a senior executive at this email. cherelle.x.latta@nab.com.au Haven’t tried it myself yet. We need to impress on them that we know the name of the annointed client that intends to carry on feedlotting – bigger and better of course. We need to impress on them that we know that the plan is to whip the DEC for damages to the bank only using all the pro bono material that Matt supplied in good faith. A win there means the bank hasn’t lost a cent and the new client gets given a stolen asset with much more sensible conditions on a new revised Licence. No matter what happens the bank can’t loose until their actions stir the masses in the court of public opinion. We know that they couldn’t give the slightest dam about the unsecured creditors (locals) and the Thompson family. All I can say is that I am a nab client till Wednesday- beyond that it is up to Cameron (CEO of National Australia Bank-Aust’s largest bank! ).Is he a man of Integrity- we will see. There has been a bit of bad press here so far but it is nothing to what we will all unleash if Wed goes badly . This isn’t a threat just a simple fact! One interesting angle to this situation is something I recall from the days when WMC was in its heyday. Hugh Morgan was in charge and he recounted advice he was given by one of WMC’s US competitors who were eager to inflict the green driven lawyers onto WMC to equalise costs. Until then environmental considerations only affected the US companies raising their cost base that Australian mining companies then did not have. Part of the tactics was to then bankroll the green movement to cause problems for their competitors as well, levelling the playing field, as it were in a global sense since mining is strictly a global business. There are variations to this agenda and include using greenmail to make life hell for a competitor, as might be the case here, etc. This approach generally falls into the odious practice of using government legislation to cripple one’s commerical competitors, usually with the connivance of some politicians and/or bureaucrats. Whether its using the EPA or CALM or other legislative tricks is irrelevant – its basically some private sector companies abusing the law of the land for commercial advantage. The total silence in the MSM and government here in WA of this situation suggests that its not to do with anti-global warming sentiments as another, perhaps far nastier, game in play. There is a stink involved with this situation and its got nothing to do with the smell coming from a feed lot. This is my email to Cherelle. The NAB have funded our Caretaker who – by legal advice – is guilty of gross misconduct. If I banked at the NAB, I would stalk in, loudly close my account and stomp out. People all over Australia: vote with your feet. The NAB has financed our potentially fraudulent and likely criminal caretaker here in Brisbane, who has systematically produced hundreds of supplementary and potentially fraudulent invoices and passed them onto our unsuspecting Body Corporate for payment. Please pass this email to senior management; perhaps you can note our building and work out who our Caretaker is. I consider that the NAB has shown cowardice and obedience to those government departments like the DEC, and NGO’s like the EDO. Why in the world would your bank stand by and let veritable thieves like the DEC destroy the Narrogin Feedlot? Why? Why? IT DOES NOT MAKE ANY SENSE. You will be exposed as a bank of cowards, the bank of fools and the bank of choice for those who wish to defraud their customers, just as you have allowed Matt and Janet Thompson’s property to be fraudulently and wilfully taken off them. This email will be posted publicly. Scottish readers probably know this already, but, for any who don’t, Clydesdale Bank is part of the National Australia Bank Group, too. An Ag College worried about the smell of agriculture, seems to have plenty of students but no ag trainers. An Ag college should be training in all facets of agribusiness. I done a course in agribusiness, Campus had stock pens and it’s own Aboittoir, no one complained about smell. What next vets scared of husbandry and birthing practices and Euthanasia. If people don’t like the smell of cowmanure, they really should live on the Gold Coast. Just E-mailed this to Cherelle at the NAB. Hello Cherelle, just a quick note to let you know I will not personally be using any of your banks or ATM’s again. The way NAB have treated Matt & Janet Thompson in WA is disgusting. The Thompsons have tried to comply with every request but you have effectively kicked them when they are down and are going to force them off their property which contains the Narrogin Feedlot. I’m sure you have the banks interest at heart but who is looking after who here. Anyone who does not work in a bank would be shocked by this. In my opinion the NAB will take over the Feedlot property and sell it to a buyer you have waiting in the wings. They will have picked up a very nice well built feedlot with your blessing. They are more than likely or about to be one of your customers. You may want to try and keep this one as I think you may be losing a few more when the story gets out about the treatment the Thompsons have received from the NAB. What will happen to the compensation claims, will the new owners now mysteriously be allowed to claim against the DEC where the Thompsons could not? No doubt they will be able to produce all the evidence gathered by the Thompsons to pursue this claim. Something stinks here and it isn’t the farm. My dad, born in Australia but raised in NZ, brought me up on stories about the ‘Great Australian Heartland’ and all the wonderful people in it. By the age of six, I was familiar with most of the Australian ‘Bush Poets’ of the 19th century such as Patteron and Kendall. My dad would be spinning in his grave now if he could see how much influence the genuine country people have lost, stolen by idelogues who are absolutely clueless about the land and about ethical behaviour. Rob Moore at no. 3 – are you saying that the bank is repossessing in order to give it to another outfit to carry on with the feedlot – i.e. legalised theft?? The impression we have gained is that someone needs the land for development, but as we are in UK obviously that is pure guesswork based on as much of the reports as we have read. Our best wishes to all and keep up the pressure. I have been thinking about this for a few days now and I hope that it is not too much off topic. Firstly let me express my full support (both honourably & financially) for Matt & Janet and their children in this hour of need. It has bothered me for a couple of days as to why NAB would attempt to remove Matt & Janet’s right to sue the WA DEC in relation to this matter and then it dawned on me that and was as a result of the recent decisions from High Court of Australia with respect to ICM and Arnold respectively and conclusively. Those two decisions (water licences – NSW) found primarily that where a Law of a State creates a “Licence” or permit AND, where provision within that same law also provides that the minister administering the law has the discretionary power to amend or otherwise alter the “Terms & Conditions” of the granted licence with or without notice to, or consent of the licensee then the “Licence” cannot be deemed as “Property” for the purposes of either unjust enrichment or acquisition of property. In other words because the “Licence” is fluid it is not worth the paper is written on therefore not property – valueless. Please remember that in these types of laws “Authorised Officers” under any specific Act are also authorised to use the “Delegated” power of the minister, which means that it is not necessary for the minister to actually oversee any decision that his/her departmental officials make. This brings me to the point that, NAB has NOT removed any right of Matt & Janet’s, because any such right did not exist at law in the first instance (refer – ICM & Arnold – 2010) HOWEVER, if NAB lent Matt & Janet financing against the creation of the “Licence” that would allow for the development of the feedlot, then it would follow that NAB is at fault (not WA DEC) through lack of due diligence and duty of care in lending money against an intangible asset at law. Additionally, it would also follow that if a right in property (Licence) did exist (including the right to sue), then NAB would own that right in any event by virtue of the financing made available for the development of the feedlot based on the “Created” licence. It can only be assumed that NAB are and were aware of the ICM & Arnold decisions. And the piggery next door has been there for 28 years!!! Great overview using facts and neighbors. The greatest stench is from the gubment. As people realize the gubment can destroy property values, people will wise up. If there is a sensitive run on bank deposits, oh well, the bank is irrational and it can have consequences. Its the Dale Stiller says: September 23, 2010 at 6:50 pm comment if you’d like to read the full version. There is a small glimmer of positive news. A few politicians have come on board to advocate for the Thompson’s cause and to try to mediate with the NAB (National Australia Bank). This coming Wednesday (September 28), a meeting has been arranged between this group of Politicians & Cameron Clyne the CEO of NAB. Matt & Janet appeal to you not to get into a bank bashing frame of mind. This whole sorry saga has been caused by environmental extremists and more specifically the DEC.
Haven’t tried it myself yet. If everyone harasses Mr. Cameron with phone calls and Emails, he is likely to simply ignore them. The best deal for the bank is a loan workout. That can be possible with a permit and profits to cover the loan. This still needs a permit. Maybe the bank needs to be reminded that the governments ministrations are infringing on their profits and ability to function. If the bank is approached from that point of view they might get a little more involved on the pro-Matt and Janet side. Politicians have come on board to advocate for the Thompson’s cause and to try to mediate with the National Australia Bank. This coming Wednesday (September 28), a meeting has been arranged between this group of Politicians & Mr. Cameron Clyne CEO National Australia Bank. Thank for you the advice about the NAB and their involvement, and the upcoming meeting with the politicians. I note that the NAB have organised a meeting with some politicians and Cameron Clyne, CEO of the NAB. I consider this a step in the right direction. The whole world is now looking at the NAB, and with that sort of audience you have been dealt a winning hand – to listen to Matt and Janet’s supporters on the ground, and to stand on the side of good productive business. Nab need to be nailed. “Strewth” makes valid points. Why would the Thompson’s be loyal to NAB (the link Dale Stillers post)? The lawyer was contracted to NAB -? One has to ask when did the Thompson’s become aware of this lawyers “other loyalty”? Looking back over my best effort, I would have to say the best question I ever asked and quantified in market research — Q: How do You define your Neighborhood? So the balance isn’t lost in all this I think it is useful to bear in mind that while part of the blame lies with warm and fuzzy legislation a lot of the problem lies with people “gaming” the system. If it wasn’t for groups like the EDO encouraging people to complain and file papers against the Thompsons none of this would have happened. It is yet to be seen (and hopefully it won’t be seen) whether there are vested interests here that have financial gains in mind. So on the one hand we have legislation that is too open ended, but it isn’t the legislation by itself that is doing the damage… sounds like the ole guns don’t kill people, people kill people line, but it is true, no? DEC carries some of the blame because there appears to have been a lack of common sense in applying the legislation when it came to the licence conditions. They are completely over the top. Me too. I don’t have money to give away but I am happy to invest at zero % interest (can’t do better than that in any market anyway) so how about shares to buy off the bank? Exactly right however you need to take a step back. By this I mean the legislation provides for a “Discretionary Power” to be used by the minister or someone acting on behalf of the minister. The problem arises with this particular discretionary power when it is used to defeat what in normal circumstances would be construed to be a “Contract” that would be struck once the “Licence” has been purchased (acquired or an exchange of monies). I think that the WA DEC may have a big problem with the validity of the discretionary power when determined against the laws governing contracts. As it stands, the department’s use of this power to defeat what would normally be a completed contract is not that unlike Governments use of the “Precautionary Principle”, or in other words the use of unsubstantiated evidential material, for the prosecution and conviction of persons thought to have breached a specific environmental law. This information won’t have to see the light of day If Mr Clyne is an astute man. We believe this to be the case and have a name. I certainly wouldn’t want to be the next owners . If the greenies can hand this on a plate to them- surely we can name and shame them out of town! UPDATED: Just added details of more support from the shire. I’ve sent a note to Janet regarding a strategy to enrol the NAB in combating the silliness from the DEC as allowing such to continue would ultimately damage the NAB’s bottom line. NAB is currently running a series of adverts showing that they are lending more money to business than all the other banks. NAB can muster far more legal resources than the Thompsons and drawing the line against changes of rules by arbitrary decrees from bureaucrats will not only work towards preserving the NAB’s bottom line, but lend it more credibility. I have no problem with banks being self-serving if it also serves their customers. Sounds like a threat to prospective purchaser’s to expose them from you? Do you consider that reasonable actions to a third party? Is the basis of your innuendo based on your interpretation of information that is accurate? Alternatively is this a hypothetical scenario? How does this implied action assist the Thompsons? I note with interest from “Strewth” @ 26 you have given more information to ponder, your posts are informative, yet not presumptuous. I thought it was illegal to steal someones asset away when they don’t want to sell. A firesale would be in order then. All this straight jacket legalese buck passing is just a game for those with all the power to keep the power. Bottom line is M&J don’t want to go anywhere else- were successful and have never done anything wrong and would not have defaulted without ” third party” interference. Pretty simple when you think about it.Nothing presumptuous surely. Does anyone have email addresses into the top levels of NAB management? Tomorrow on Monday we need to give the Thompson support that we are all capable of doing; contacting the NAB with the message in UPDATE #2 in Joanne’s posting above. We can also add that a negative result from the meeting on Wednesday will be a public relations disaster for the NAB, not only in Australia but also world wide. Who is “we”? Is this based on fact or innuendo? If this is fact, one would assume that this is documented alternatively, if this is innuendo / speculation this would be considered presumption until proven otherwise would it not? Are you suggesting that the Thompsons were coerced by the lender to sign documents to allow them to carry out their business venture? Are you insinuating that financial institutions do not have the right to implement a mutual agreement signed by all parties? Are you suggesting that there be a public campaign to stop any prospective purchaser’s from indeed purchasing this property? Would this not be parallel to the minority of complainants whose letters are now on public display? If so would that not indeed have legal repercussions due to the fact that the public would then be dictating to private individuals how they conduct their private business, and the instigators of such a campaign? “Sounds like a threat to prospective purchaser’s to expose them from you? Your post @ 32 states,”I thought it was illegal to steal someones asset away when they don’t want to sell.” Would you be able to post link to the financial institutions illegal activities so this can be verified? Naturally the Thompsons would not wish to leave. However, surely one has to question their success in retrospect of the situation they are now in? I will elaborate here, “success” by measure of possibly legal advices to themselves, not securing in writing documents, but instead accepting a spoken word on their license terms and conditions prior to financial institution exercising its right of receivership? You would be right Blunt- no point speculating! We should take strewth’s advice and be patient for whats done is done and a good outcome is what we are all waiting for. @ Rob Moore, “Patience grasshopper..” tread carefully, the key is in the door…now to turn it ever so gently, to be blunt..
can be found in this new, open to all, new site from the Agmates stable. Matt Thompson has asked that all publicity before the meeting with the NAB on Wednesday be kept positive. So please no “bank bashing” when I ask you all to on Monday 27th of Sept to make contact with the NAB with the message above. I can inform you that the politicians meeting with the Cameron Clyne of the NAB, amongst others will be John Forrest & Dennis Jensen. John Forrest has said that he intends to inform NAB that he will be taking the floor of Parliament Thursday to talk about NAB’s actions if they fail to remove the receiver. Senator Cori Bernardi intents to the same to the floor of the Senate. I believe that it wouldn’t hurt to email these politicians to say good on you, stay firm to your support of the Thompson’s & of justice. I seem to be missing something in all this, and it makes me wary. The lightly veiled threats and innuendo are of concern. I cannot see how a bank foreclosing has committed a crime. 95,000 in USA did just that in July 2010 in the homes sector alone. I suspect many of those banks would have passed the information onto third parties who may have an interest in purchasing a home. Where is the crime? Many matters have been taken out of context. The “watercourse” is one. The law as applied to that is consistent with the laws throughout Australia in similar circumstances where pollution has the ability to affect catchment areas. A great many cases have been decided on the same principal. I view with great concern the power and means of objectors to conduct substantive appeals to the the Appeals process funded by taxpayer’ funds. Their ability to affect the Appeals process is nothing short of scary. Any resolution to be reached is totally at the mercy of these groups of objectors. If they cannot be swayed it is nonsense to talk of another buyer. Without a licence clear of all unnecessary regulation, then the property is unlikely to fetch anywhere near it’s true value as an operational feedlot. I don’t believe there is any proportional blame to be sheeted against the Thompsons. They simply were corks in a storm, in an environment that was downright unfriendly to them. I note the Narrogin Environment Action Team has been active in other litigation. The DEC I feel had a duty of care to the Thompsons. The DEC had no definive duty of care to the NAB. The NAB in the circumstances may have breached a duty of care to the Thompsons, but it’s a pretty thin line. So it is my considered opinion that if the Receiver is going to achieve anything positive, he should convene a meeting of all groups with an interest. A “Fire Sale” is not in the interest of the Thompsons or the public at large. One last thing. In NSW there is legislation that allows a “consent” ( in this case licence) that has been revoked to undergo a process of “regularisation” to obtain “ex post facto” approval. That has been upheld in the NSW Supreme Court of Appeal and as such would likely be available to the WA Supreme Court. I believe the Thompsons have more than satisfied any obligation on their part to succeed in any such proposal. These are some of the reasons that make me wary. I think that your interpretation of “lightly veiled threats and innuendo” as expressed by others has more to do with frustration of others than anything else and in any event if you read the thread it appears to have been resolved and I’m sure that being poked in the eye by an internet “Byte” is hardly inconsolable. You say – “Many matters have been taken out of context. The “watercourse” is one. The law as applied to that is consistent with the laws throughout Australia in similar circumstances where pollution has the ability to affect catchment areas.” – You seem to trip over with this one because a “Watercourse” is a subjective definition in environmental law, and it has not been taken out of context because it is located in a “Paddock” that in normal circumstances and practises of agriculture and primary production would be used for the grazing of livestock or cultivated for the production of grain indifferent to whether there was a feedlot located nearby. You say – “So it is my considered opinion that if the Receiver is going to achieve anything positive, he should convene…………………………..” – So gather up your practising certificate and file your “considered opinion” with the receiver. You say – “The DEC had no definive duty of care to the NAB.” – That’s simply b/s Norm. You are suggesting that WA DEC has a legaly defensible right to make false or misleading statements to NAB in relation to any requested due diligence with respect to the licence or licence application. You say – “The NAB in the circumstances may have breached a duty of care to the Thompsons, but it’s a pretty thin line.” – I don’t think that any financial service provider would consider a breach of a duty of care or a lack of due diligence on their part as a “Thin Line”. Lending money based on a tangible development is one thing however, the regulatory risk of the intangible operating licence is certainly a matter of due diligence on the part of the financial provider. You should not be so “Wary” – you could get ulcers from that. Beginning of your response, “I seem to be missing something in all this,” all you needed to write. “The lightly veiled threats and innuendo are of concern.” Concur with “Strewth’s” analysis of this in response to you. You wrote, “A “Fire Sale” is not in the interest of the Thompsons or the public at large.” Are you sure Norm Martin? Is not the alternative outcome (given the fact that still current the Thomspons must vacate October 15th) for the Thompson’s to be able to clear debt,repay unsecured creditors? Are you saying that this could not be achieved? What are you implying Norm Martin? “The DEC had no definive duty of care to the NAB. The NAB in the circumstances may have breached a duty of care to the Thompsons, but it’s a pretty thin line.” Wrong again Norm Martin. I have not permitted this response to your post, to ramble, as above response from “Strewth” does address the key issues. You are the one cherry picking. What exactly is you angle? I am wary because we are getting information that is less than com[lete. You make some astounding quantum leaps without reading (and researching what you say). Y don’t have to answer to your rambli,g allegations, and I stand by whay\T I say. Just how you think the DEC has a duty of care to thr NAB. Absolute BS. Do you really believe there is some surrealistic conspiracy here where objectors are determi,i,g who gets to operate a feedlot, and have attacked the Thompsons with an end to terminating their ownership? They don’t want a feedlot. I stand by what I said about the receiver’s role. He has a discretion to decide the outcome. His decision(s) will determine the outcome. His appointment is a fully lawful one, and I would br directing real arguments to him, not innuendos. I am an advocate of meaningful discussion, and a satisfactory outcome to that is the only way the Thompsons will get an outcome that will give them long term satisfaction. A fire sale will not. I say again to you, do some seriou research before shooting off your mouth. The Farmers’ Voice… a new publication updating farmers on AFFF activities and developments (download below). The AFFF supports farmers in their fight against unfair and unwarranted barriers to the development of sustainable farming practises and vibrant regional communities. To Colin Hall- I recently attended the NFF Congress and personally asked80% of the trustees of the AFFF- why they wouldn’t support a defence of this situation? Answer-Can’t because it is not in the national interest????!!! Sorry Blunt but I am being patient! “You are the one cherry picking. What exactly is you angle?” The truth, what is yours Norm Martin? “You make some astounding quantum leaps without reading (and researching what you say).” Assumption and wrong. “Just how you think the DEC has a duty of care to thr NAB. Absolute BS.” Are you that ignorant in the ways of law? Maybe you would also like “Strewth” to answer this as well this poster may be more patient, we both addressed that in our individual responses? “Do you really believe there is some surrealistic conspiracy here where objectors are determi,i,g who gets to operate a feedlot, and have attacked the Thompsons with an end to terminating their ownership? 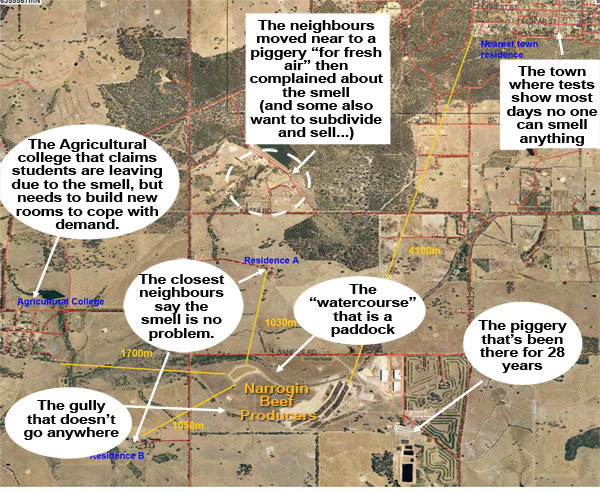 They don’t want a feedlot.” For Gods sake Norm Martin – READ what Jo Nova and the Thompsons have shown! Then comprehend it before such an ill informed comment as this leaves your computer again. “I stand by what I said about the receiver’s role. He has a discretion to decide the outcome. His decision(s) will determine the outcome. His appointment is a fully lawful one, and I would br directing real arguments to him, not innuendos.” Why would you think otherwise? “I am an advocate of meaningful discussion, and a satisfactory outcome to that is the only way the Thompsons will get an outcome that will give them long term satisfaction.” Your previous posts on the whole Thompson topic on this site suggest otherwise. Suggestion Norm Martin, read what you have posted…you are beginning to annoy me a tad, i may choose to ignore your ill informed ramblings. “A fire sale will not.” Issue answered previously. “I say again to you, do some seriou research before shooting off your mouth.” Its a keyboard actually, Norm Martin,it appears you need to practice what you preach. To be blunt, you appear to have limited concept of this issue, whilst you have raised some interesting points that would be in the Thompsons best interest, some ill informed views, i would suggest are detrimental to this most helpful site of Jo Nova’s and ultimately the Thompson’s, however that is an opinion only. Your post most is appropriate regarding NFFF. I too must practice more patience. Despite numerous phone calls, and appeals from parliamentarians to wait for the outcome of the meeting. The receivers determined to act quickly before the meeting could take place. They coming at 8:00 in the morning (Tues 28-09)to get the plant and equipment and remove it from the site. If you persist in being offensive, so too will I. Go bag your head and act your age. Thank you for updating your supporters here. Your posts are important to the facts. It is appreciated in this difficult time for you and your family. A man alone, gate chained, desperately fighting for his rights. His right as a protector to save his children from feelings of intimidation, security that only a father can give. His rights have been eroded once again. No news crew, no local papers to help document this on his property, no moral support in the flesh…yet..the unwavering support that this man, Matt Thompson has taken from his friends, the National and International words of encouragement on this site, Anthony Watts and Property Rights Australia on Agmates have given him the strength to endure today’s event. Well done Matt Thomspon you have made your family proud, and us your supporters. Well done blunt for comment above; to you stewth & John from CA thanks for your solid support of this cause. Why would the receivers act before the October 15 deadline, which doesn’t even seem legal, and why did they choose to ignore requests from highly respected Parliamentarians. The whole situation is unbelievable. I think John from CA could be onto something. I have been thinking the same thing – Matt chained the gate – yet the receivers were not quite game enough to cut the chains – why?? Certainly not because this is something that they haven’t come up against before (meaning resistance!!)?? Nope, just an opinion, but maybe, just maybe it would be break and enter if they did so? IF that is a correct assumption, and Matt could have had them charged ! Now wouldn’t that be something to write about!? !